Lest you think I had a leisurely weekend, what follows is proof positive that I worked my hiney off. Well, not off. Not even a little bit off. But I did work pretty darn hard. 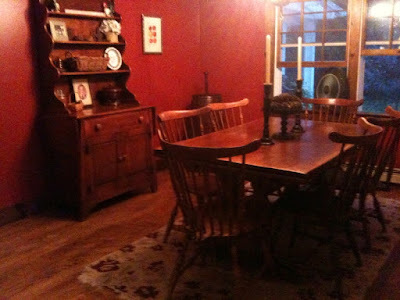 Without further ado… our dining room. BEFORE. Then after. Just so you know. Please forgive the very poor photos. I took them on my iPhone, I cannot seem to use my Nikon in the house for anything larger than a dinner plate. Thankfully my kid’s heads are smaller than dinner plates. I know. Beauty, isn’t it? The border? The coordinating upper and lower wallpaper choices? a little spackle… a little primer… no more edges! And yes, I did paint right over the wallpaper. Well, first I put a solid coat of primer over the wallpaper and then painted. Why? Because I’m lazy. And because I pulled the wallpaper down in our bedroom and it took me a full 4 days to complete that room. I’m still having nightmares in which I’m standing, ankle deep, in wallpaper scraps. Here we are mid-paint job. Since we were using such a dark color, we needed two coats (actually we could have used 3 but I’m too cheap to buy another gallon). This was after the first coat. Voila! All done! I’m going to change out the light fixture and add some curtains, but that’s pretty much all she wrote for this room. So far we’ve knocked out the family room, living room, hallway and stairway, girls’ room and our bedroom. We’ve got a couple more rooms to go, but it’s starting to feel a lot more like home ’round here! Great job! That room is lookin' mighty nice!! LOVE the wall color! Major improvement–great job! Why do people do wallpaper….is it just to torture the next owners???? Love it! I have to admit…when I saw your post on my dashboard and saw the pic (not knowing it was the BEFORE)…I was a bit fearful. My impressions of your good taste went out the window. But thankfully, I clicked on to read and see the AFTER! Beautiful! And as always, I love your writing. Super talented! Can you please email me your motivation?? Great job! LOVE the red! I don't blame you for painting over the wallpaper. I have done my share of taking down wallpaper and it is so not fun. I am all for the easy way out. I love homes, painting, redoing- I will be following along! Can't get rid of me that easily!! Hopefully I'll be wearing the latest and greatest wild olive tee while reading your next post!! You are a hard worker… but nothing gets in the way of a mom making a house a home! Blessings to all of you! I love your adorable family!! Looks good. Do you know of a charity that helps children with limb differences? Missing limbs, amniotic banding. etc.? Thanks for all your work in China, it gives us an easy way to help to. 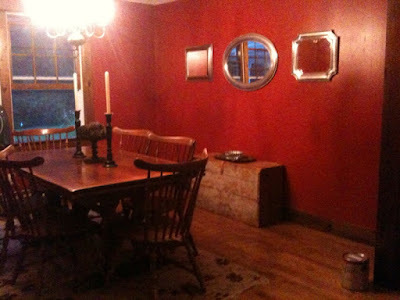 Every proper Southern home has a red room. I realize you aren't in the South now, but at least you have a proper Southern home! Very nice…I'm just thinking you can't all really sit there…cause, well there aren't really enough chairs. I'm figuring you have a plan! I just finished posting pictures of Josiah's toddler life book and those pictures didn't come out great either but I'm hoping it helps someone hesitant to begin the project. It can be overwhelming and it doesn't have to be. 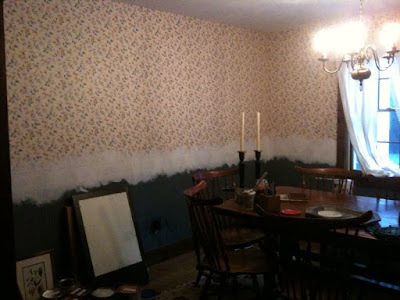 I think painting over wallpaper is a GRAND idea…never.do.wallpaper.period. What's up with your camera? Aren't you the mamarazzi? sp???? 🙂 Better get that figured out before you meet the newest China blessing!! Post photos of the other rooms… there's just something about before/after shots that most of us women love! 🙂 You're plugging right along… Superwoman!!! I love it! It looks very New England Puritan/Hip. 🙂 Stefanie, I'm dying to know more about how the process to Vivi is going, our computer died, and I don't have your e mail anymore, drop me a line, let me know! Thank you thank you for the post. I love the red. 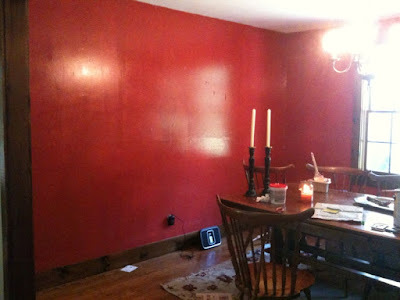 We are gong dark for our dining room (painted over wall paper already.) 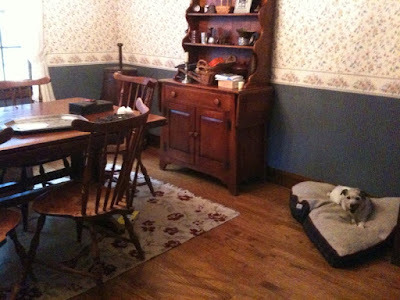 We are down to the dining Room and the 'office' then I can start decorating. I think I have finally decided on an idea for the mantle. Beautiful! I wish we could have painted over the wallpaper here. Curls, rips, gouges, and air bubbles – no chance. So before we started Li'l Empress's adoption paperwork, we spent our last tax return to pay someone to do all 7 areas at once. I had already done the kitchen and laundry room. It was the best $$ we ever spent, and now we only have our dining room to finish! Wallpaper is from the devil, I'm convinced. My house was a model home and the builders put coordinating wallpaper throughout – without properly treating the wall board. It took us two months to get the giant fruit print wallpaper off my kitchen! I will never put up wallpaper, so long as I live. Beautiful! Will look for more pics. You are doing a great job! I think you did an amazing job! We just recently moved too and just the unpacking was enough for me lol! Can't wait to see more HI projects! Hope all is well and that you are now enjoying all your hard work! Wow you are getting a ton done! I love love redecorating and making a new house my own. Cant wait to see MORE! I LOVE the red!! The room looks beautiful. Great Job! Looking forward to seeing more pictures, because I enjoy home improvement projects. Looking good Stefanie!! I do like this sort of stuff so I will be watching!!! Hey, so will there be more before and after photos forthcoming?? Wow, such fast work, I moved at the end of July and so far haven't painted a drop. My roommate has both her rooms decked out and painted, though! This looks great!! You put me to shame. I've been trying to motivate to paint ONE room this summer and I have 1/2 the number of kids you do. Can't wait to see some more before and after pics.